Melinda Lopez created Mala during her own experiences caring for her aging mother during the particularly brutal winter of 2014-2015 in the Boston area. Through the semi-autobiographical main character, also called Mala, Lopez forms these experiences into an exploration of how we engage with taking care of aging family members and whether we can possibly live up to the standards we hold ourselves to under such circumstances. 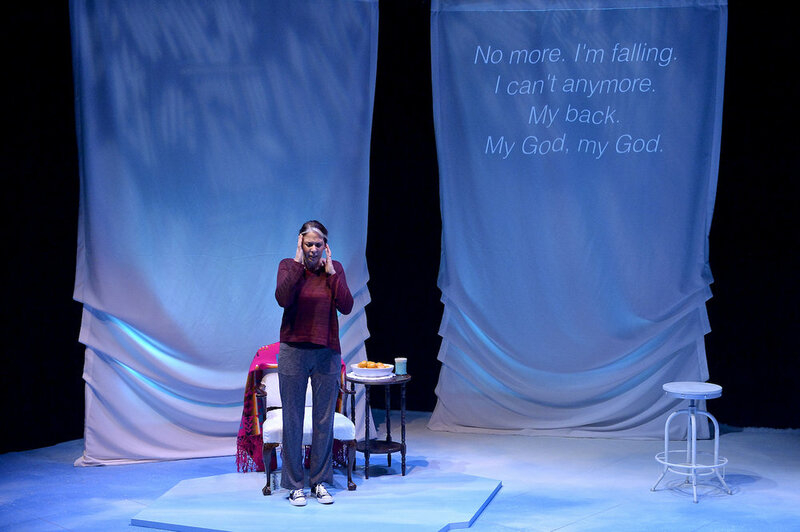 The show is framed as Mala speaking directly to the audience, telling stories of experiences during that winter and the past experiences that shaped her family and led them to that point. As the show progresses, moments emerge where Mala is emotionally pulled back into those experiences - instead of controlling the conversation and talking about them, she is speaking from a place of being in them. These shifts are very subtle at first, later growing deeper and richer. For the sound and music in the show, I chose a primary palette of pure tones, reminiscent of bowed metal or glass. This was inspired by the meditative quality of the show as well as the pure, crisp, icy clarity of winter. I sometimes give these tones a bit of jitteriness to bring a sense of warmth, energy, and life as well as subtly reflecting physical, human responses like a feeling of butterflies, excitement, or anxiety. I use a deep heartbeat (often played only through subwoofers so it is subtly felt more than heard) to bring a layer of personal, indescribable emotion. The opening cue of the show reflects element of all these. Director David Dower and the design team chose to focus on accentuating those moments when Mala is swept back into the moment. Through careful coordination across everyone on the team - director, performer, and all the designers - these cues are all timed and tuned to feel as though they emerge from Mala herself and her experience rather than something imposed on the moment. My sound system included various speakers upstage of the scenery as well as surrounding speakers to allow for a sharp sonic focus onstage or a diffuse, airy quality as needed moment to moment. Earlier moments are very subtle and played at a barely noticed level. Later in the show, two moments become more deep and enveloping. For these cues I blended naturalistic sounds with the abstract musical palette to create a full sonic experience of those moments both physically and emotionally - here, Mala is truly absorbed by the memories.